Tonight is the first night of Channukah, or Hanukkah if you prefer. To celebrate, check out what the short film risk-y filmmaker Jason Merrin (C'13) created in honor of this first night. Then, enjoy this holiday viral hit: "Hanukkah in Santa Monica"
...A very funny (non-Chanukkah, but still Jewish!) spoof on the making of Disney's new princess: the Jewish American Princess. I know we're all Jewish, but was wondering still, if Santa would come here and give us a thrill. On my way home, no Christmas lights did I see, on the houses, the windows, not even the trees. Was it really December or a warm summer's night? I drove past the deli's, there were lines out the door. The restaruants were busy, Christmas dinners not planned. Never, not here we're in Boca Land. Snoozing came easy to me Christmas Eve. I wasn't waiting for presents to be left under a tree. Then all of a sudden he pulled up in his Jag, with a sack full of presents each sporting a tag. Oh Bloomies, oh Saks, a computer and more. He knows where to shop, he frequents my stores! He looked for the lox, the bagels and jelly. "I have a long night ahead, I want you to know. From Boca I leave for Boston and the snow." What a great night I thought with a sigh. "Shalom to you all, and OY, what a night!! 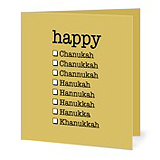 Love, love love these Hanukkah/Chanukkah cards!